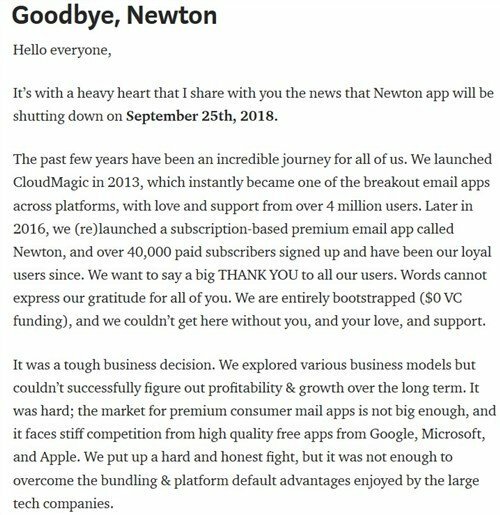 Newton Mail shuts down on September 25th. You may remember the app if you had used it when it was called CloudMagic. The problem with Newton Mail, was it came at a price, quite literally. You had to pay a monthly subscription fee of $4 for accessing all the features. That is nearly $50 a year, which is how they actually advertised the premium tier. That was enough for people to look away. The company admits that they could not sustain as a premium app. Though we were fans of CloudMagic, we switched to free alternatives when Newton Mail was launched. Here are some good alternatives for Newton Mail ? Honestly, there is not sure any email app offers the features which Newton Mail had. But here are a few alternative email apps. I’m not going to mention Gmail or Inbox, because people use them a lot already. K9 Mail – Free, Open source, No ads. It is the favorite app of many. The only downside is an outdated GUI, but some users may actually like it. There is the K9 Material (unofficial fork) hosted on F-Droid, if you want a more pleasant design. Outlook – I’m not kidding. Microsoft’s Outlook for Android outshines Gmail in almost every department. It has a better interface, a Focused Inbox and includes a built-in Calendar. 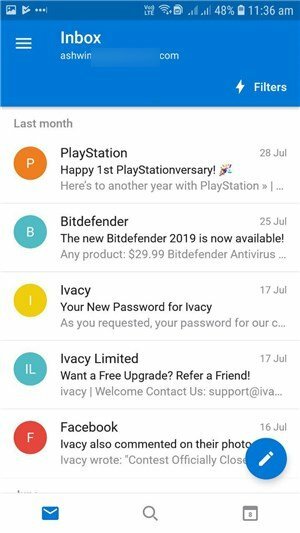 Proton Mail – Free and highly secure. Proton values privacy more than other companies. They even offer a free VPN. 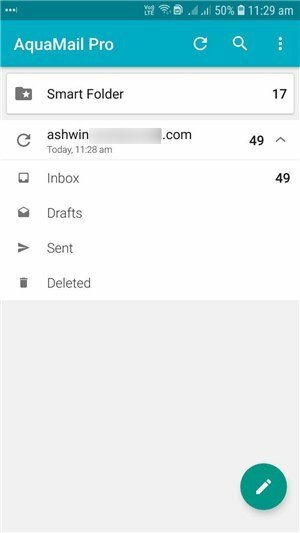 Aqua Mail – This is the app I use. A one time fee unlocks the premium features which includes. The app has been misunderstood to send data to the company, but you can disable the diagnostics option (which is enabled by default). The app frequently goes on a 50% discount sale, so if you are deterred by the $10 price, pick it up when it is $5. Nine – Email & Calendar – At $15, it is probably one of the priciest email apps. But if you want a good mail app which supports Exchange, look no further. Spark – Another controversial mail app which stores data on a 3rd-party server. Read more on reddit/r/privacy. Did you know that the majority of popular email apps on Android and iOS do the same?